Wang Anyi, born in 1954, is currently vice-president of the Writers’ Association of China, president of the Shanghai Writers’ Association and professor at the Department of Chinese Language and Literature of Fudan University. In 1955 she moved with her mother to Shanghai. In 1970 under a government policy of the Cultural Revolution she was settled ion rural Wuhe in Anhui Province. In 1972, recruited through a competitive examination, she joined the Xuzhou Regional Cultural Troupe of Jiangsu Province as a member of its musical band. In 1978 she was transferred to the China Welfare Institute Publishing House in Shanghai to be fiction editor for Children’s Epoch magazine. In 1980 she attended the literature workshop of the Writers’ Association of China. In 1983 she attended the International Writing Program of the University of Iowa. 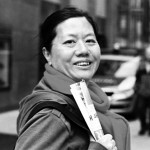 In 1987 she was invited to be a professional writer of the Shanghai Writers’ Association. Her works, which began appearing in 1977, include more than 100 short stories, 40 novelettes, 10 novels and various prose pieces and essays. She has won numerous awards, her Who’s the Future Squad Leader? Won a National Children’s Literature prize, The Last Stop of This Train won a national Short Story prize, Gone with the Tide and Baotown won the National Novella prize, Uncle’s Story won a Shanghai Novel and Novella second prize, A Story from the Cultural Revolution and I love Bill won a Shanghai Novel and Novella third prize, The Song of Everlasting Sorrow won a Shanghai Literature and Art prize and a prize at the Fifth Mao Dun Literature Award. Her novel An Age of Enlightenment won her an Outstanding Writer award at the 2008 Chinese Language Literary Media Awards Ceremony. Her books in English include The Song of Everlasting Sorrow, Lapse of Time, Love in a Small Town, Love On a Barren Mountian, Brocade Valley, and Baotown, which was a finalist for the Los Angeles Times Book of the Year award.